The plot in a nutshell? 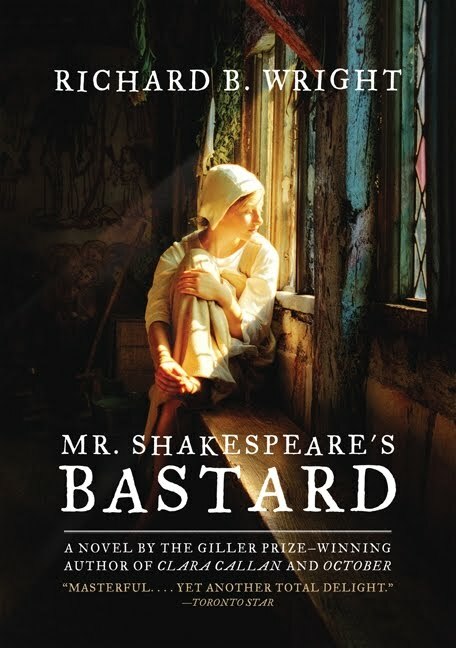 As the title implies, the main character, Aerlene Ward, is the illegitimate daughter of Mr. Shakespeare, author of such well known plays as Romeo and Juliet, A Midsummer Night's Dream, and Hamlet. Her mother Elizabeth had an affair with Shakespeare when she was a young woman recently moved to London, and Shakespeare was a young actor and playwright living in London while his wife and young children were left behind in Stratford Upon Avon. It is written as though Aerlene at age 80 is dictating her memoir, and jumps between the "present day" with Aerlene as an elderly housekeeper; her mother's story of growing up and moving to London as told to Aerlene; and Aerlene's own childhood. It didn't have the same emotional clout (in my opinion) as Clara Callan, but again I was amazed that such believable female characters could be written by a male author (no offense intended to any men reading this!). It was a pretty easy and enjoyable read, and I passed it on to my sister to read as she recovers from an appendectomy. I thought it was a well crafted book in terms of the storytelling, and was sad when it ended. And that's about all I have to say. There were no deeper meanings in this book to discuss; no controversy to pick apart; no unresolved issues. I enjoyed the book, and will leave it at that. I love, love, love Clara Callan, and have gifted innumerable copies to people who live outside Canada, including one to my sister. But none of Wright's other books have done it for me. I struggled through Adultery, gave up on Farthing's Fortunes. They were all well-written, but didn't quite carry me along. This one sounds like more of the latter. I hope your sister is doing well! This one was well written (in my opinion), and paced well enough that it was an easy read - it was more the lack of anything deeper that I was disappointed in. My sister is doing well - the day of her surgery, I was sent to the local library to get some fluffy books that she could read while curled up in bed. She polished off Mistress of Nothing the next day, then moved on to the others. I suspect that now she is back to full time parenting of 3 young kids, she has a bit less time for reading this week! I thought this was quite well done too; I know it's not fair of me to constantly want Clara Callan in every book of his I read, but it's hard to know how much that interferes with how much I've enjoyed the others. Maybe a re-read of Clara would get me over that!